GET TEXTURE, BODY AND SHEEN, QUEEN! 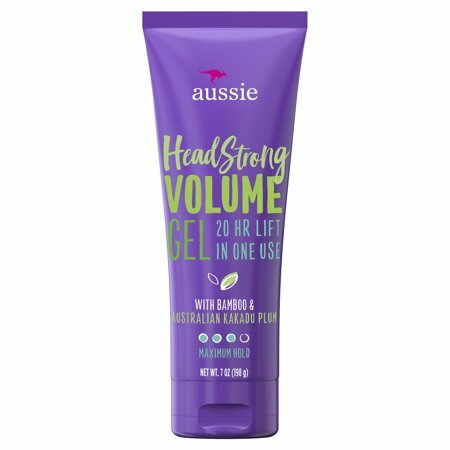 Aussie Headstrong Volume Gel gives your hair volume, texture and 20 hours of maximum hold without stiffness or crunch. Infused with Australian Kakadu plum and bamboo extract, this citrus and floral scented volumizing gel for hair delivers the lift you need to give your style life. Simply work a dollop through hair, shape and dry to style. Ingredients: Water/Eau, Laureth-23, Polyquaternium-4, Hydroxyethylcellulose, Benzyl Alcohol, Acrylates/Beheneth-25 Methacrylate Copolymer, Aminomethyl Propanol, Dmdm Hydantoin, Fragrance/Parfum, Acrylates Copolymer, Disodium Edta, Aloe Barbadensis Leaf Extract, Ecklonia Radiata Extract, Simmondsia Chinensis (Jojoba) Seed Oil. Instructions: Sheer a dollop of this sculpting gel into palms and apply to hair with fingers. Style as desired. Hold Level: 3 maximum., 20 hour hold in 1 use., Made with Australian aloe, jojoba oil and sea kelp, this gel will add texture, body and sheen to your strands. I only paid $2.77 for mine, so I think this might be a larger size. This hair gel was a great value for the money. A little goes a long way with this gel. I use it daily to give my hair a boost of volume. When I flat iron my hair it stays perfectly straight and has a bounce to it and when I curl my hair it helps maintain the curls all day. Adds volume to my fine hair without feeling stiff. I ordered this product on recommendation of a friend. I couldn't find it in store, so I had to order on line. I am very satisfied and may be able to replace several thongs that haven't worked as well. Works Great on Short Hair! It doesn't get sticky, keeps my hair shiny and soft and in place. It smells nice too. I bought this based on the great reviews it received and I am very happy with my purchase. I used to use Garnier Fructis Super Stiff Strong Hold Gel until they stopped making it, but thanks to Aussie, I don't need any other styling gel for my short hair. I highly recommend!